An argument can be made that the scanning of paper records must play a larger role in the federal plan to promote EHR adoption. What was the federal government thinking? 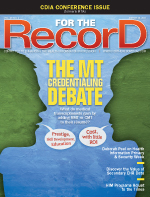 As providers are being nudged to convert paper medical records into EHRs, some healthcare leaders are wondering why there weren’t incentives built into the meaningful use requirements to account for the cost of converting existing paper records into digital formats. Currently, EHR incentive funds are designated for office-based physicians and hospitals that treat significant numbers of Medicaid and Medicare patients and meet the incentive criteria as defined by the HITECH Act, namely to become meaningful users of certified EHR systems. However, the incentives do not reward providers who convert their current paper files to digital records. It’s a sticking point for those who view the process as an essential component on the road toward a more electronic healthcare system. Last year, Iron Mountain, a Boston-based information management services company, called on the Centers for Medicare & Medicaid Services (CMS) to expand the scope of meaningful use incentives to reward providers with federal subsidies for digitizing paper records and scrubbing patient databases. Iron Mountain had made its recommendation in response to the CMS’ Notice of Proposed Rulemaking. In comments at that time, Ken Rubin, Iron Mountain’s senior vice president and general manager of healthcare, told the CMS, “In hospitals today, managing patient records consists of an inefficient patchwork of systems, processes, and decisions. If a hospital has poor processes for storing and managing hard-copy medical records, simply digitizing them will only add to the mess, not help solve it. “Health systems that first streamline their paper storage and workflows for handling records not only establish the right framework for an EHR, [but] they can also find as much as $1 million in savings to help fund their transition to electronic records,” he added. While the comments fell on deaf ears, the point was made that the conversion to EHRs will occur as an evolutionary process over years. “So, for the better part of a decade, it’s reasonable to expect that hospitals and doctors’ offices will be living with a combination, or hybrid, where some information will be electronic and others will be paper based,” Rubin says. Iron Mountain believes that if more providers converted to digital technology (ie, the orderly scanning of documents such as doctor’s, nurse’s, and medication notes), it could reduce the healthcare industry’s reliance on paper and accelerate EHR adoption. John Fontanetta, MD, FACEP, chief medical officer for EDIMS and chairman of the emergency department at Clara Maass Medical Center, part of Saint Barnabas Health Care System of New Jersey, says the purpose of a digital record is to make pertinent information readily available. Besides deciding what types of data should be included, it’s equally important to know what should be left out, he says. To advance that concept, Fontanetta says incentives are needed. “My recommendation would have been to incentivize for creating a synopsis of the patient record. For example, let’s say I am a pediatrician and had treated a patient for 12 years. What really would be nice is if I could create a one-page, unified synopsis,” he says. John King, chief operating officer at EvriChart, a document management company based in West Virginia, says the concept of meaningful use is difficult for many providers to understand because “there’s such a disparate level of readiness.” He’s also a proponent of incentivizing healthcare organizations to convert from paper to digital records. Ironically, according to Evrichart Chief Information Officer Tony Maro, healthcare organizations can meet all meaningful use criteria yet still not be able to provide a patient with a digital copy of his or her medical record within 48 hours. Tom Griga, global healthcare manager at Cincinnati-based Cintas, also backs the idea of an incentive to transform paper-based clinical information into the digital formats needed to reach meaningful use. The most common requests for patient information, whether it’s in a paper or an electronic format, include discharge summaries, physician and nurse notes, operation notes, and lab/radiology results. Once the reality of getting paper records converted to digital is achieved, other challenges remain. For example, how is legacy data handled to avoid it being “orphaned”? Recently, a hospital encountered a problem with data being left behind. After replacing its radiology department system and all radiology reports that were not in the paper charts because they were now considered part of an EHR, a staff member noticed patient files remained on the server. When questioned, the EHR vendor told the facility it would not be loading those records into the system. According to Griga, among the first things a healthcare organization must do when converting from paper to digital is to devise a strategic plan that addresses all areas of care. At the same time, a physician champion must be identified.